An interview with leaders at the United States Environmental Protection Agency – part of a NEHA effort to highlight stories of dedicated professionals working to keep our communities healthy and safe. The 2017 California wildfires burned more than 1.2 million acres, and broke records for the worst wildfire season in the state’s history. Wildfires cause serious environmental damage, and the smoke poses serious human health threats to the heart and lungs. The United States Environmental Protection Agency (EPA) has distributed a wealth of knowledge and resources to inform health departments and the public so they can be better protected against these threats in the future. • Christina Baghdikian is an Environmental Health Scientist in EPA’s Office of Research and Development. • Dr. Tim Benner is a physical scientist in the Office of Science Policy in EPA’s Office of Research and Development. • Kathleen Deener is the Acting Deputy Director of EPA’s Office of Science and Policy. • Dr. Wayne Cascio is the Acting Director of EPA’s National Health and Environmental Effects Research Laboratory. NEHA: What brought you to the environmental health profession? Baghdikian: I grew up in South Lake Tahoe, CA where you are fully immersed in a culture that is dedicated to protecting the surrounding pristine environment. Since the lake has had some problems with quality degradation and invasive species, slogans like “Keep Tahoe Blue” were a mantra that reflected responsibility and pride. I enrolled in the undergraduate public health program at the University of California, Irvine, and immediately gravitated towards environmental health classes. I learned the importance of protecting the community through prevention and reducing the need for individual level treatment, which led to me enrolling in the University of Michigan, School of Public Health for a Master of Public Health in environmental health sciences. I knew my educational journey was heading in the right direction when I started taking risk communication courses. In my current role as an Environmental Health Scientist, I am fortunate to combine my passion for environmental health with science communication and science translation on a daily basis. Benner: After graduate school I did a one year American Association Advancement for the Sciences science & technology policy fellowship in the U.S. Senate. From there I found a position in science policy at the EPA focusing on air regulations. Most of those, of course, are designed to protect public health. Deener: In short, a deep appreciation for and keen interest in the natural environment (I grew up in the mountains of western Maryland) and a love of science... Especially chemistry and health-related science! I studied chemistry in college, worked for a few years doing environmental sampling and lab analysis for an industrial operation, and eventually went to graduate school for public health with a focus on environmental health and risk assessment. Cascio: My entry into the environmental health profession had its origins while a college student when I worked for the Department of Agriculture/Animal Plant Health Inspection Service (APHIS) in their Chemical Methods Development Laboratory. During this time, I began to appreciate the links between the decisions we make during the production of our food and our population's health. During my time with APHIS I contributed to many methods that included identifying and measuring steroids in beef, heavy metals in tissue, antibiotic metabolites in chicken, and pesticides in fish. But after entering medical school I took a different path following a call to be a physician. During a long career as a clinician-scientist caring for patients with heart disease I became intrigued by the observation that exposure to airborne particulate matter influenced heart patients. The mounting evidence of this relationship led me to become more involved with the U.S. EPA first as a consultant, then as a co-investigator, and later as a member of the Clean Air Scientific Advisory Committee to the Administrator. In 2011 I left academic cardiology to join the EPA as the Director of the Environmental Public Health Division in the National Health and Environmental Effects Research Laboratory (NHEERL). Currently I serve as the Acting Director of NHEERL. NEHA: In the event of a disaster such as wildfires, communications are crucial. Did the recent wildfires in the U.S. have any positive impact on efficiency and communications between federal, state, and local agencies? Baghdikian: Over the last year, I have been involved with an exciting wildfire study and gained some perspective from working on that project. During the wildfires, I saw our partners in federal, state, and local agencies join in a collaborative effort to make sure there was timely, accurate, and actionable information to help people protect their health while escaping imminent danger. In this time, I have also realized the strong network of people dedicated to wildfire research and wildfire smoke response who make themselves available on the ground to answer questions and provide guidance to protect public health. For example, we all worked together to quickly design infographics, like those shown here, to be disseminated via social media that describe actions people can take to protect themselves and the proper way to wear a mask. Cascio: I believe it's fair to say that each disaster offers an opportunity for federal, state, and local agencies to learn from their experiences and improve the process of communication and effective messaging among one another and to the public. The 2017 wildfire season was a particularly perilous season with millions of acres burned, lives and properties lost, and associated adverse effects on human health and ecosystems. Based on the experience of previous years and preparation, the level of communication amongst federal, state, and local agencies was outstanding. NEHA: The recent fires in CA have made national news, making the public more aware of the risks and dangers around wildfires. What do you wish the public knew to protect themselves against the health effects of wildfire smoke and air pollution? What are environmental health professionals doing to help the public become more informed? Baghdikian: Working with state, county, and local public health officials and others, we created information to be used before, during, and after fires. 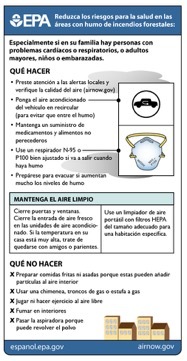 For example, we developed the infographic below in English and in Spanish to explain the steps an individual can take to reduce exposure to wildfire smoke. 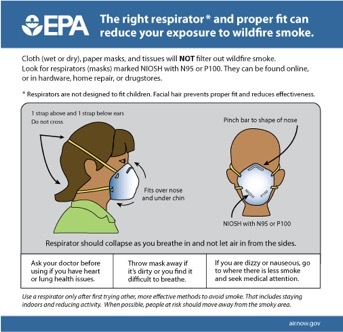 Public health officials can access the Wildfire Smoke: A Guide for Public Health Officials developed by EPA, CDC, and others to understand the public health impacts of wildfire smoke exposure, learn how to plan for smoke events, and understand actions individuals can take to reduce smoke exposure. This guide is a great resource and has planning and response information on a variety of topics. For instance, public health officials can find guidance on where and how to set up cleaner air shelters. Prior to an event, these shelters can be advertised to the community so they can know where they are and plan how to get there to reduce exposure during a smoke event. There is also information on how to make plans for pets and livestock. - Pay attention to local air quality reports via local news media, local air agencies, or the AirNow site. As smoke gets worse, take greater action to protect yourself. - Stay indoors. Fine particulate levels are generally lower indoors, especially in a tightly closed home with central air conditioning. - Reduce physical activity to lower the dose of inhaled air pollutants. - Reduce other sources of indoor air pollution, such as cigarettes, unvented stoves or heaters, aerosol products, frying or broiling meat, candles, incense, and vacuuming. - Use air conditioners, especially central air conditioners that recirculate indoor air, with medium- or high-efficiency particle filters. - Use room air cleaners - but not ozone generators. - Wear respiratory protection if necessary. Choose a mask called a "particulate respirator" that has "NIOSH" and either "N95" or "P100" printed on it. One-strap paper masks, surgical masks, bandanas, etc. will not protect against smoke inhalation. - Relocate to a cleaner air shelter if necessary. This may be especially important for sensitive individuals and those with leaky homes. Those who live in fire-prone areas can prepare for fire season by stocking several days of nonperishable foods that do not require cooking, buying an air cleaner, creating a clean room in the home, and buying a supply of N95 or P100 masks. Those with heart, vascular, or lung disease, including asthma, can talk with their health care providers about when to leave the area and how much medicine to have on hand. Environmental health professionals are working hard to get the word out to public health officials, medical professionals, and the public. For example, federal agencies manage the AirNow site with up-to-date air quality information across the U.S., as well as information and advice about wildfire smoke. 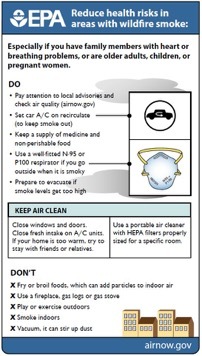 They also produced a detailed wildfire smoke guide for public health officials. At EPA, we've also created a new smartphone app called "Smoke Sense" where people can learn about wildland fires and smoke health risks in their area. Additionally, we're advancing partnerships and collaborations with public health organizations and state agencies. These partnerships are creating new venues for sharing information and resources about environmental health issues like wildfires. 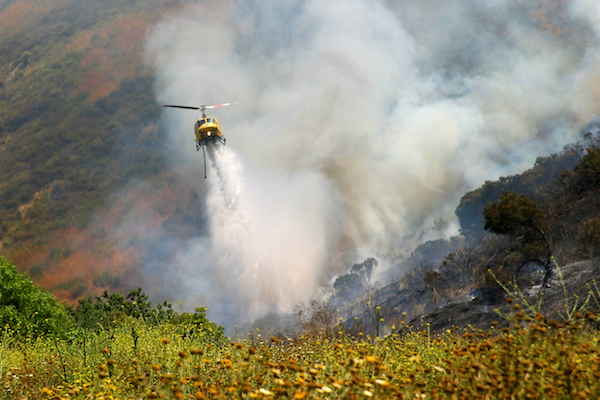 NEHA: Do you think the response to wildfires and preventive measures has improved throughout your career? Cascio: Without question the response to wildfires and preventive measures has improved over the last several years. Communication is better across agencies, and with state and local public health officials. More actionable information is now readily available to the public and to public health officials. EPA's AirNow.gov website now features a Wildfire Current Conditions link that provides locations for active fires, modeled smoke plumes, and air quality information – along with health advisories. The Wildfire Smoke: Guide for Public Health Officials has been updated and is available online at the AirNow website. A free continuing education course on Particle Pollution and Your Patients Health was developed by EPA and is now offered by the CDC on their website. This course was developed for health care practitioners, public health officials, and health educators. More than 5,000 people took advantage of EPA's Smoke Sense smart phone app that provided current information about air quality and smoke plumes in their local area during the California and Washington state fires. The introduction of the health effects of particle pollution and smoke as a cardiovascular risk factor in the Million Heart Initiative is a new element in CDC and CMS' Million Hearts 2022 program. The inclusion of this important information by Million Hearts into their program will massively expand the reach of information and guidance to avoid smoke-related PM to both the public and practitioners. The EPA contributors to this story will be sharing their work at the 2018 Annual Educational Conference (AEC) & HUD Healthy Homes Conference, June 25-28, in Anaheim, CA. NEHA has compiled a comprehensive list of resources on the topic of wildfires and emergency preparedness on our website. Support the work of the National Environmental Health Association and those keeping our communities safe through Membership. This project was facilitiated by NEHA staff members Jonna Ashley (Membership Manager) and Nancy Finney, MPA (Technical Editor).